Native American flute music is a beautiful art form which is seldom recorded by anyone except performers trying to preserve their own Native American heritage. Once those recordings are made, they are generally purchased by tourists looking for a reminder of their vacation. Thus it is a musical art form that has little exposure or innovation. Generally when non-traditional instruments are used for Native American flute music, the attempt is made because a producer wants to create a relatively cheap album for consumers of New Age music. It is far too rare to find an album such as this, where someone who was not raised listening to this music gives it serious consideration and finds ways to express the music to a new audience. Ms. Zucker is an exquisite performer with a long resum�, more than twenty successful albums to her credit, and wonderful technique. Thus it is with great interest that one can approach this album. There are few virtuoso flautists with a more adventurous spirit or a more varied collection of recordings to their credit. For those intimately familiar with different traditions in Native American music, there is one work of loosely Apache origin (Canyon Echoes for flute and guitar), and another (American Suite for flute in piano) is from Kwakiutl tribe. The traditional melodies used are most frequently Hopi. The pieces themselves are not actually traditional works performed with new instrumentation. Rather they are new compositions; some based on traditional melodies, others creating new melodies using non-European techniques that directly emulate sounds made by traditional flutes and flute players. For those less knowledgeable of the traditions, the music tends toward Mixolydian or Lydian modes or pentatonic scales, often with very open harmonies and an introspective quality to the melodies. The timbres are used to paint aural pictures or tell stories. As a result a great many timbres are employed. At times the melody or tempo will jump unexpectedly in order to achieve an effect of there being a new speaker or player in the story. There are attempts in some cases to use alternate fingerings, flutter-tonguing, glissandi, multiphonics and harmonic fingerings to summon the haunting sounds of the cedar flute. The result is not unfamiliar or disjointed, but it is also distinct from European derived music. A great number of the pieces utilize solo flute with no accompaniment. Additional instruments are added when the standard-issue soprano flute is not totally equal to the task. Saxophones, acoustic guitar - at times using Flamenco-derived finger-tapping techniques - and piano are all utilized to give voice to this both-ancient-and-modern music. It is well recorded in a large, live room that lends a more haunting quality to the music with its warm tones and long reverberation times. The package insert book is quite well done, and thorough in its description of the compositions. It tells us where the melodies are newly composed and where they are borrowed. It gives original instrumentations when the original instrumentation is known. All told, this is a very good and engaging collection of works. 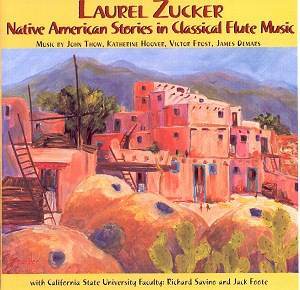 Anyone interested in flute music, both of European and Native American varieties would probably enjoy this album.